The first thing I say when I wake up every morning is “Okay Google”. Now don’t worry - it’s not shrieked amidst some kind of panicked, cold sweat. I’m not having nightmares about search engines, or even the prolonged suffering of Google+ (though someone surely should be). For the past month, saying “Google” is the way I’ve been turning off my alarm, ever since being sent a review unit of Google Home, the new smart assistant. That’s how you wake it up. With “Okay Google”. Not content with controlling much of our online - and offline - lives, Google now wants us to shout out its name in our own homes. The first morning I did it I felt ridiculous, but figured I should give it time. After a month, it’s time up, and it doesn’t feel any better. I’ll now attempt to explain why this may pose a problem. I often tease my predecessor in this job, Richard Taylor, for being the only person I know who uses Apple’s personal assistant Siri to its fullest. You’ll be standing there, minding your own business, and Richard will pull out his phone and start dictating a text message. Right there. In front of strangers. I find it awkward, he finds it convenient. I can see the appeal - he uses it often enough so the voice recognition is pretty much spot on. But what I don’t think I’ll ever understand is his lack of self-consciousness when it comes to talking to a piece of metal in his hand when there are people around. You’d have to snap all my fingers off before I’d consider such a thing in public - but one place I thought I might just get over myself is in my own home. And so, in the corner of my kitchen, I have an Amazon Echo, the stylish little black cylinder that glows blue when it’s listening to me. And in the corner of my bedroom, the equally-stylish Google Home, with its little whizzy-blob lights that spin to attention. Both devices are very neat - the voice recognition is accurate, the speaker quality is terrific, and the computing power behind them both is smart enough to mostly decipher even my cryptic commands. I talk to them in a voice that’s only barely audible so as not to alert the neighbours to the super-nerd next door. But here’s the difference. To access Amazon’s assistant, you ask for it by name. It’s the same for the other players in the digital assistant game like Apple’s Siri or Microsoft’s Cortana. You don’t necessarily have to say the name to get started, but you feel you’re interacting with a character nonetheless. There’s a reason why all our favourite sci-fi artificial intelligence have that human factor. Knightrider’s Kitt. Holly in Red Dwarf. Samantha in Her. Even the heuristically-programmed Algorithmic computer was humanised as HAL. It makes us feel warmth towards them. One famous exception might be C3PO, but then, he was a humanoid. Behind the scenes, I realise it makes no difference whether I’m saying “Okay Google” or “Hey Alexa”. There’s no added privacy implication, nor practical benefit, to either approach. Both devices are doing precisely the same thing - using my data to help me out (and later sell me something or other). Back in October, when Google held glitzy events around the world to launch Google Home, I managed to get in a brief chat about all this with Michael Sundermeyer. He leads the product design team for the device. Giving it a friendly name was considered, he told me, but said the reason they dropped the idea was pretty straight-forward: they wanted to constantly give the impression you were accessing Google directly. Not an assistant, but all-powerful, all-knowledgeable Google. “What this does, this Google assistant… this is Google,” Sundermeyer said. The grand pitch for why we should all want one of these personal home assistants is that it will blend into family life and become indispensable. Being able to talk to the device as if it were a real person helps greatly to achieve that aim. 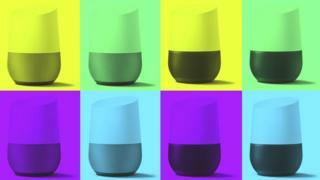 Given Google Home has the full might of the Google ecosystem behind it, it stands the best chance of providing a smarter service than Alexa, Siri or Cortana. And so it seems silly to me to let something like this get in the way. And so I’m going to attempt to use whatever moderate influence this blog has to change Google’s fate and come up with an alternative. A friend pointed out that all the mainstream assistants (with the exception of Siri) so far have female-sounding names, arguably gently reinforcing the idea that being an assistant is still somehow solely a woman’s job. It means I’d be starting each morning in bed saying hello to “Larry”, but whatever. The neighbours are confused enough anyway.